Nautilus Hyosung Inc. is a technology leader of self-service solutions in ATM hardware, ATM and financial software, as well as banking services to the financial sector. With over 30 years of experience in the industry, Nautilus Hyosung has developed proven technologies to help their customers achieve greater effectiveness in their businesses and better bottom line. With its forward thinking management and research departments, Nautilus Hyosung is able to effectively integrate its software development capabilities with its sound hardware manufacturing platforms with speed and flexibility. This leads to a better and more durable ATM product. Providing complete solutions in hardware, software and electronic banking services to the financial services and off-premise markets, Nautilus Hyosung will commit to enabling maximum cost reduction, security and creating new business opportunities for our partners. 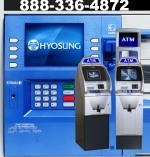 At one time, Hyosung made ATM’s for Tranax Technologies. Later, Tranax began their own manufacturing and Hyosung formed Nautilus Hyosung for the US market. By 2007, Nautilus Hyosung had exported 100,000 ATM’s. Monimax 5100T: A very popular outdoor ATM. Available in a walk up configuration. The Nautilus-Hyosung Monimax 5100T is a proven ATM workhorse that we recommend for in wall installations.